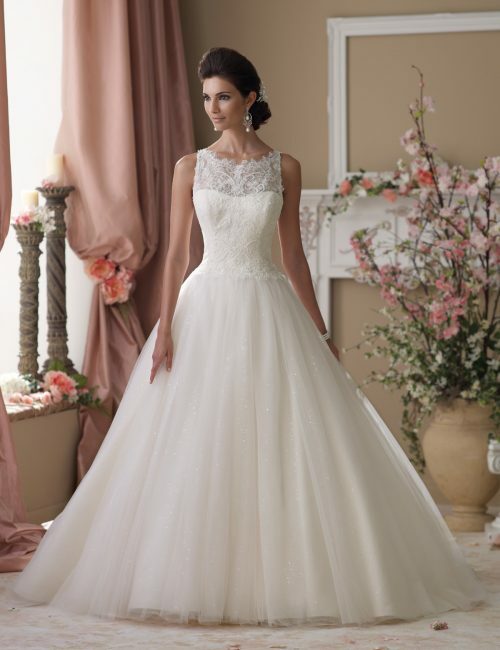 Sleeveless wedding gown, tulle, organza and re-embroidered metallic Alencon lace appliqués over taffeta ball gown, illusion and lace bateau neckline over sweetheart bodice, dropped waistline, illusion and lace back with pearl buttons, multi-layered full skirt with chapel length train. Two-piece Alençon lace and French tulle wedding gown set, strapless hand-beaded re-embroidered Alençon lace boned bodice with sweetheart neckline and dipped back, separate asymmetrically layered French tulle A-line skirt with chapel length train, detachable spaghetti and halter straps included. 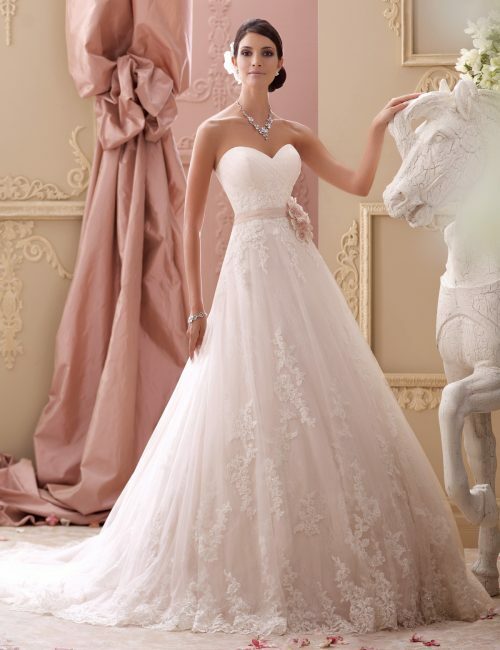 Sleeveless hand-beaded embroidery on tulle over soft satin trumpet gown with V-neckline, sweetheart bodice, dropped waist, beaded illusion blouson back bodice finished with covered buttons, chapel length train. Strapless a line lace wedding dress allover soft lace, hand-beaded corded lace appliqué and tulle over satin with sweetheart neckline, directionally fine pleated tulle bodice with corded lace appliqués accented with beading and softly curved back bodice, detachable grosgrain self-tie ribbon belt adorned with three-dimensional flowers with beaded centers at natural waistline, layered tulle skirt with matching beaded lace appliqués cascading down allover soft lace, scalloped hemline and chapel length train, detachable spaghetti and halter straps included. The Berger Collection for Mon Cheri headpiece style 9613 sold separately. Embellish by David Tutera ring style Elizabeth, earring style Madeline, necklace style Madeline and bracelet style Madeline sold separately. 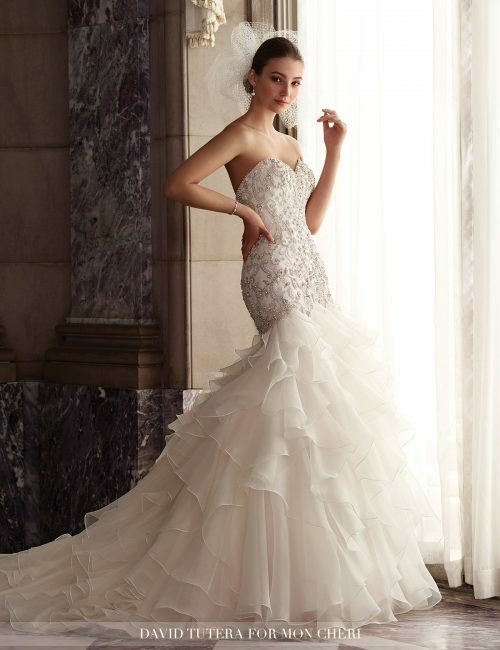 Strapless organza trumpet gown with sweetheart neckline, hand-pattern beaded embroidered motif bodice with dropped waist and V-back, full dramatic ruffled and tiered organza skirt spills into chapel length train, detachable spaghetti and halter straps included. Strapless embroidered lace and tulle ball gown wedding dress, hand-beaded deep sweetheart neckline with beaded illusion modesty piece, intricately beaded and embroidered lace bodice with chevron detail, dropped waistline with lace trim, full softly gathered tulle skirt with chapel length train, detachable spaghetti and halter straps included. Fit and flare wedding dress, strapless hand-beaded re-embroidered Alencon lace appliqués over allover soft lace and soft satin, cage dress with plunging sweetheart neckline with illusion and beaded modesty piece, dropped waist, skirt, satin slim underskirt with sweep train, tulle and lace appliquéd multi-tiered scalloped cage overskirt with chapel length train, detachable spaghetti and halter straps included. Vintage lace wedding dress, sleeveless hand-beaded embroidered lace and tulle over luxurious satin slim A-line cage dress, plunging sweetheart neckline with illusion and lace modesty piece, dropped waist, lace appliqué illusion back bodice with covered button closures, satin slim underskirt with sweep train, tulle and lace appliquéd cage overskirt with scalloped hem and chapel length train. Sleeveless corded Chantilly lace, tulle and sequin over satin ball gown wedding dress, illusion and lace bateau neckline over a softly curved corded Chantilly lace bodice with natural waistline, illusion and lace back bodice features crystal button closures, gathered tulle and sparkling sequin skirt with chapel length train. The Berger Collection for Mon Cheri headpiece style 9506 sold separately. Sleeveless soft lace and taffeta modified mermaid gown with hand-beaded and re-embroidered lace appliques, tip-of-the shoulder illusion and beaded lace straps, scoop neckline and back bodice, hand-beaded and embroidered lace bodice accented with Swarvoski crystals, pleated taffeta midriff accented with jeweled motif at center, covered buttons trail down back bodice, chapel length train with matching beaded lace appliques and pleated gore inset.